Our fall mailing features the heartbreaking story of Raha who survived an unimaginable act of cruelty when firecrackers were put inside his mouth, his mouth taped shut and the firecrackers lit. Although Raha, whose name means peaceful and free in Persian, survived the assault, his face was terribly disfigured. Why do the nicest animals always seem to be the victims of such hostility and cruelty? Although Raha lives as a stray street dog, he is an older dog and very gentle. Yet even before this attack occurred, someone had cut both his ears off. Raha came to Home for Life® in August, and was so emaciated because he couldn't open his mouth enough to take in the food he needed to nourish himself, let alone heal from his terrible injury. Yet he had a great will to live and was still a kind hearted dog, despite all he had suffered. 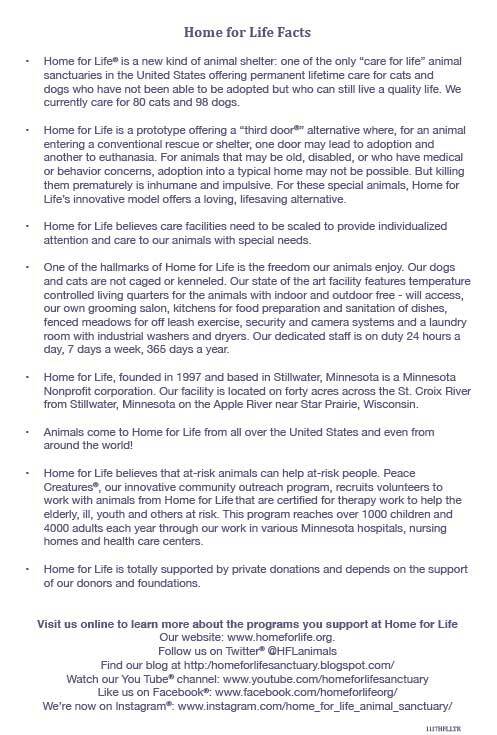 He knew Home for Life® would help him, and as hard as his story is to read, it has had a very happy ending thanks to the generosity of our supporters. Today, just a few months later, Raha is happy, healthy and though he will always bear the disfigurement, a permanent marker of the cruelty he suffered in his past life. 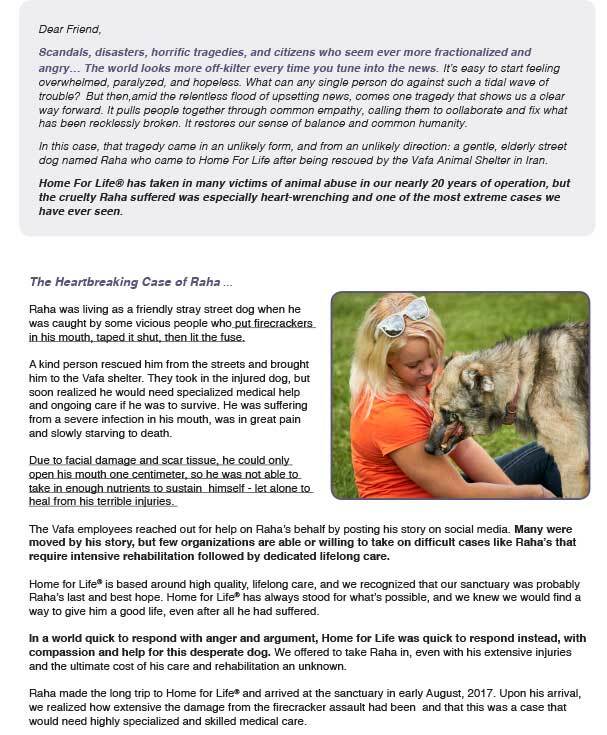 Raha's story is an emblem of how kind and generous people can come together to meet evil and cruelty with good, to make the life saving difference for vulnerable animals. We know Raha's story will lift your spirits and restore your faith in the goodness of people. If you want to join Home for Life's® "Army of Good" who are making the difference for animals like Raha who otherwise would have no chance, there is no better time to give than now! Every gift up to $25,000, given before the end of the year, will be matched by two generous donors! Imagine the animals whose lives you will save, whose lives you will change with your gift! And now your gift will do twice as much good, and go twice as far. Thank you from all of us at Home for Life® for your support in 2017, which has made it possible for us to help so many desperate animals like Raha.